Everyone who has started building small test circuits knows this problem well: you want easy access to low voltages often not found off "wall-wart" packs, and it needs to be something which plugs into a breadboard easily. 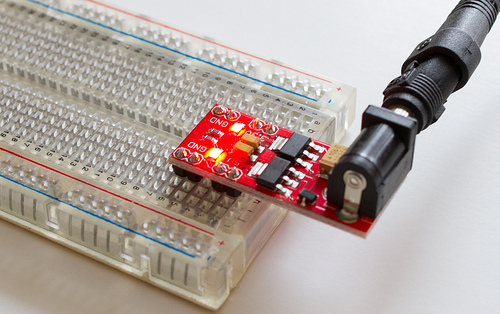 You can get plenty of small bench supplies which will deliver the voltages, but you're still stuck with less than ideal ways to connect it to your breadboard. 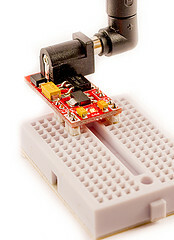 Alternatively you can build a small power supply on one end of the board. Or, you could use this board. This board packs the regulators, smoothing capacitors, and a power LED into a small board you can easily plug into any breadboard. Unlike some breadboard power supplies, this one sits in the "IC" well of the breadboard. This means it will fit any breadboard, and can provide two different voltages off the same DC input. It provides easy access to the remaining pins of each row to connect it to any side power rails or any other wires which need to be hooked to either power or ground. They are shipped fully assembled (as shown in the photo above). DC Output: 5V @ 800mA, 3.3V @ 800mA; maximum draw from all outputs must be less than 1A. 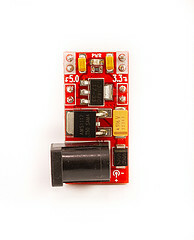 3.3V regulator is chained off larger 5V, allows more 3.3V current at the cost of total output being marginally lower. Schematics and Gerbers coming soon.. The PCB design and schematics are released under Creative Commons Attribution-ShareAlike (BY-SA). Versions 1.x and 2.x are now deprecated. Version 3.0 is available from Nice Gear. Some further pictures of the board in various stages of design and versions.